Stitching yesterday we stiched the panels together. If you want to know how to make fibreglass spliced panels go to the excellent bateau.com tutorial section. For stitching you need help! 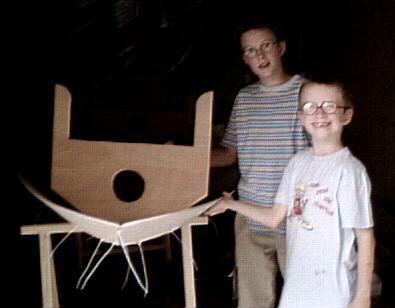 These are my helpers: Antony and James. 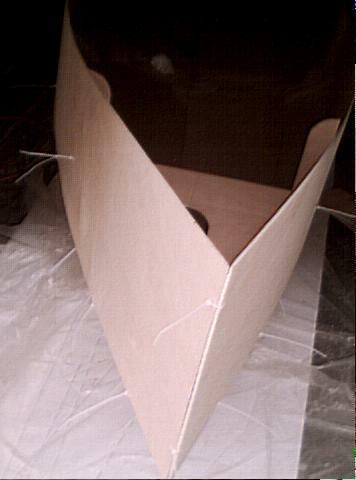 This is the bow - my garage is on the dark side of the street and my digital camera is of the low end 99€ type... We will get better pictures outside when the hull is glued. Stitching took us about 90 minutes. We now have a 4.80 metre long hull that is 1.06 metres wide. This is 10 centimetres longer than planed and 2 centimetres wider. The error comes from scaling the plan up on a photocopy machine instead of printing it out from the DXF file. A 2% error in length and width is perfectly acceptable to me.